I define it as a team that strives to drive change and success for the clients they serve. A team that works daily to understand marketing trends and tactics that light fires of inspiration, change, and action from the audiences our clients serve. A team that overcomes the odds and the naysayers. A team with passionate hearts and minds that desire to do great work. Four years ago, I joined the Catalyst team, taking the leadership position a year into my journey. The continuous striving to bring forward marketing solutions that are different and that drive true tangible results has always been my mantra. And finding a team that embodies this very same passion is what it has taken to break barriers in the student housing, multifamily, and residential real estate space. Today, we celebrate taking the #23 spot in the Austin Business Journal’s annual Book of Lists. This list recognizes the top 25 companies in their respective industry verticals. Making this list is the first step in what I see as a continuous climb to the top. Keep an eye out for Catalyst. The gate is open, and we’re running through it. 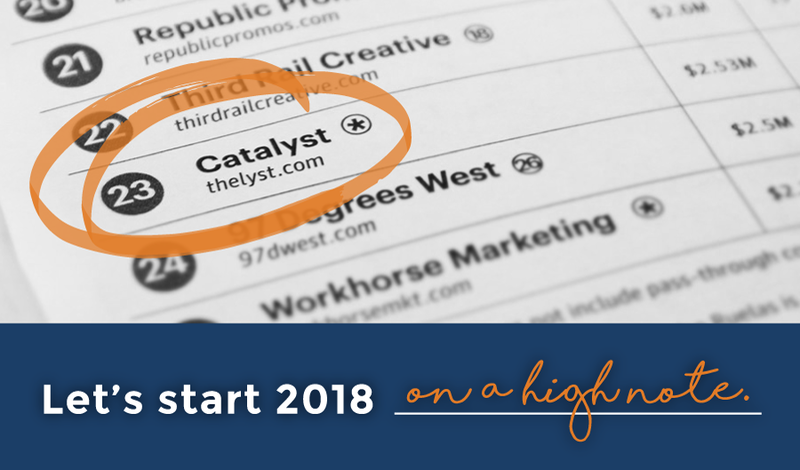 Congratulations to the Catalyst team and to our clients for embracing marketing prowess that drives success.